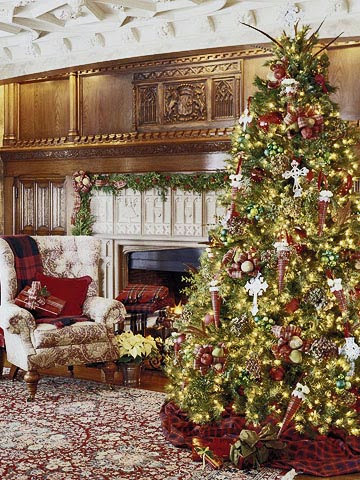 2805: O Christmas Tree Inspiration! in lieu of the weekly Potpourri Friday Party! invitation details here or below. To get you started and provide some great inspiration here are a few great trees for you to feast your eyes on. The sparkly silver and frosty blue give this tree an icy feel of this cool wintery theme. 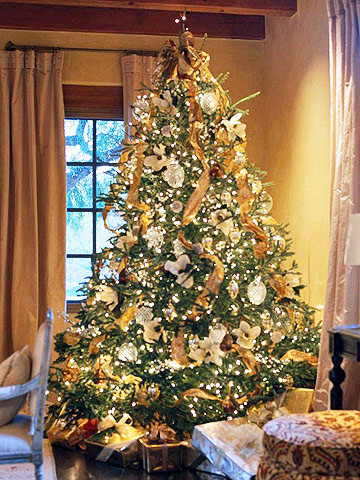 Feel a warm golden glow with this tree wrapped in gold ribbon clear lights, and gold ornaments. 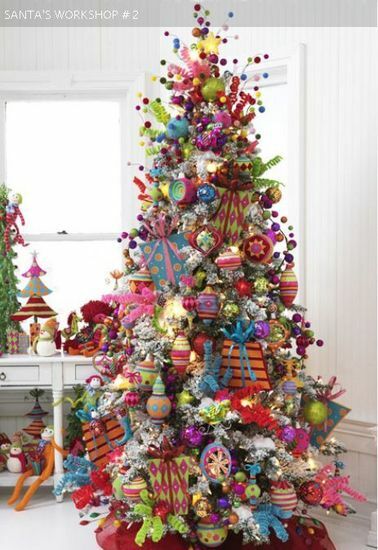 ﻿﻿Be totally whimsical and create a Santa’s Workshop Tree! ﻿﻿﻿﻿﻿﻿Need more whimsy? 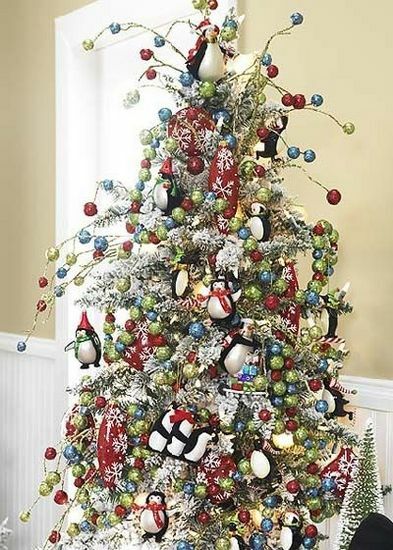 Then try out this cool and whimsical tree complete with penguins! ﻿﻿If you are dreaming of a white Christmas, what could be better than a tree like this? 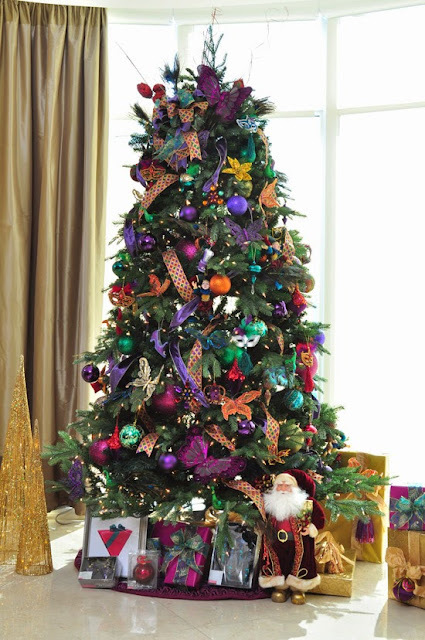 You may feel like attending a Masquerade Ball with this tree decked out in luxurious jewel tones, crowns and peacock feathers. 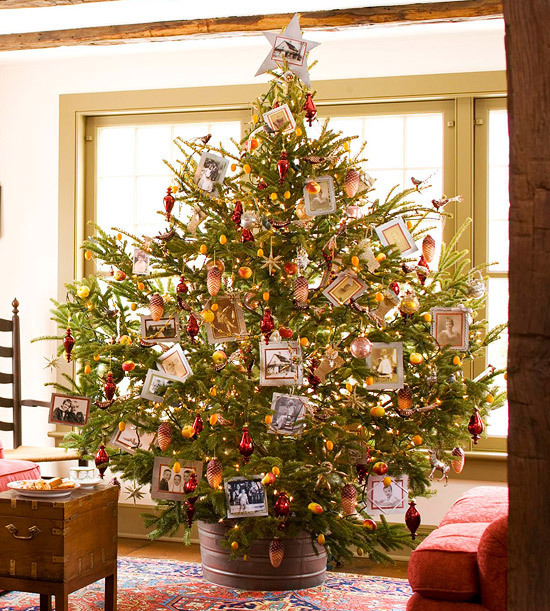 ﻿﻿This Family Tree is one of my favorites using photocopies of favorite family pictures and ornaments. ﻿﻿﻿Feeling Patriotic? 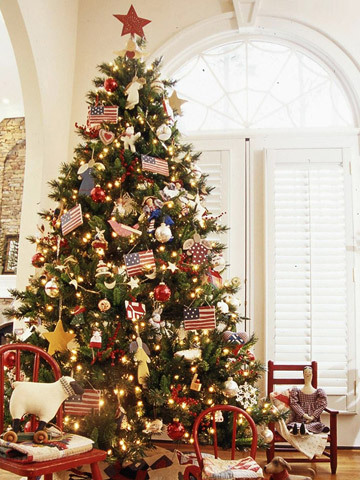 Decorate in red, white and blue! ﻿Create an urban lodge look with plaid ribbon, woodland ornaments, pinecones and berries. Or, be totally traditional! It speaks for itself in classic red against evergreens. 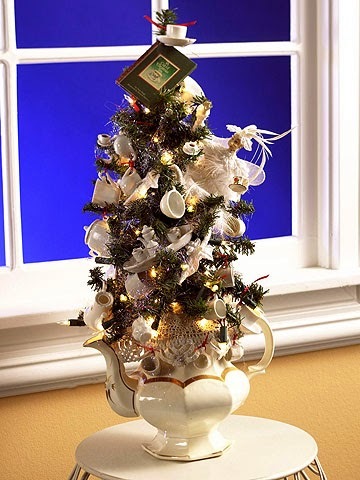 ﻿﻿For small spaces, you might want to try a miniature tree set in a teapot and dressed in miniature cups! How sweet! This reminds me of one of my very favorite trees from last year. Can you guess who? So, get inspired and decorate, and plan to attend one or all of the fabulous parties on this invitation. Grab the button on my sidebar or the sidebar of one of the other hostesses to help spread the news of this fun week long event. 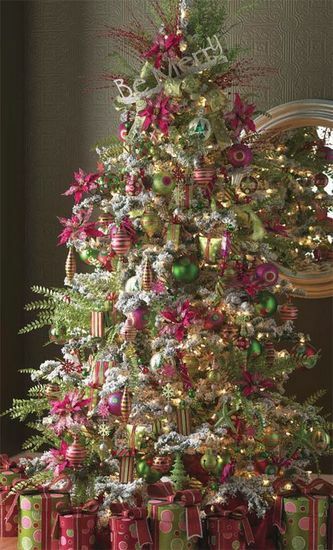 The Christmas Tree Party will be in lieu of the weekly scheduled Potpourri Friday Party! Oh Honey ~ I am really looking forward to your party! Thanks for the wonderful inspiration in the meantime!! oh my are those trees fantastic! I am non inspired- to this point I have not been looking forward to holiday decorating- especially the tree! Such beautiful trees and wonderful inspiration!! I'll definitely have to join the Christmas blog party! These are all so pretty, Honey!! I am really loving the Family Tree...is that a blue spruce? 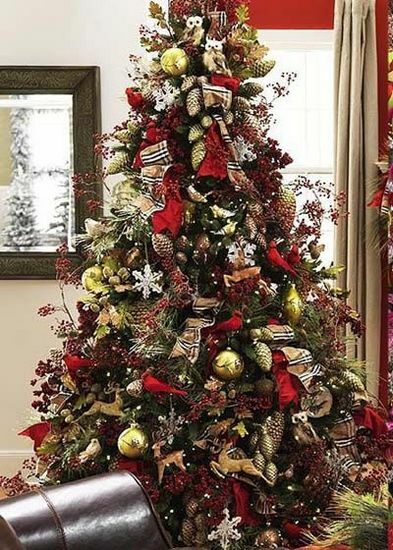 I am thinking of getting that kind this year but have never decorated one like this. Oh well, we'll see. I am definitely in on the party!! Honey, A great post to share Thanks ! You sure picked some pretty trees to share! Just lovely!! I can't wait to deck our halls!! I love this time of year!! Great inspiration! I am looking forward to all the upcoming parties! Lovin al1 that inspiration Honey! As if I am not in the mood for Christmas already--now I really can't wait to get my tree! Your latest follower. What a lovely inspirational group of trees. I have just the post for one of the blog party days. Thanks for the inspiration! Love the little tree in the teapot! I might try that! thanks for linking up to fridays unfolded! 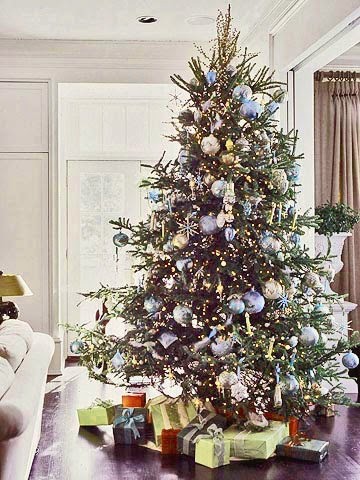 Your party will be wonderful Honey, and you really have me anxious to get my tree up now! It sounds like a lot of fun and lots of great stuff to read! I like the santa's workshop themed tree best. So much fun! Now this is a post that has gotten me REALLY excited for Christmas. I love every single one of them. Can't wait to party with you, it's going to be fun!! Love the tree inspiration. I usually do my traditional thing but have an idea now that I will steal. Thanks for that! Gorgeous inspiration! 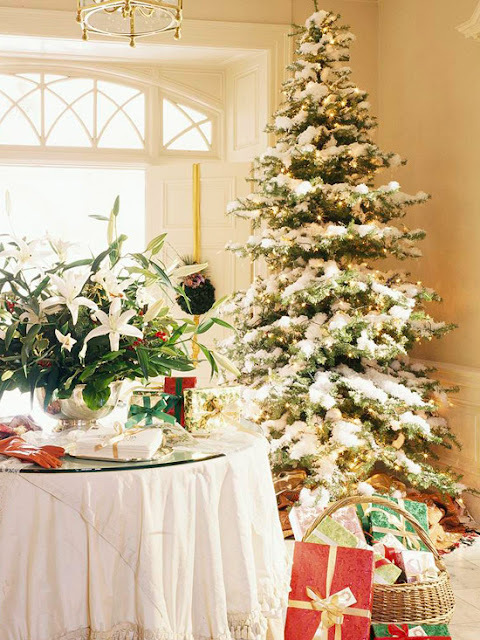 I love the White Christmas tree best. Beautiful Trees, love them all! Visiting from Funky Junks SNS, I'm #55, and I'm now following you! I love this post! I am going to post the family photograph tree on my blog. 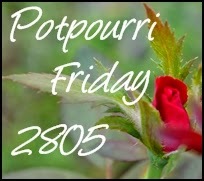 You know I'm going to be there because I do love me some Potpourri parties! So many awesome trees you've displayed. Thanks for ideas. Amazing ideas and inspiration! I'm looking forward to this! I love the tree with family photos! Oh wow, I love all these gorgeous trees!!! They are amazing!!! I truly enjoyed seeing all these gorgeous trees. I definitely will not have one anywhere close to these. It's very hard to choose but love them all!